Have you ever wanted to get away – to anywhere warm…or maybe anywhere in Europe for a long weekend, but didn’t have the time to conduct award searches for every single route? I often get travel urges to burn miles and travel after reading trip reports and seeing people’s pictures on Facebook. As a spontaneous person, I’d love the ability to see what availability is out there for different destinations. I love looking at maps and thinking, “With my miles I can get there!” Putting the pieces together can be a pain, though it’s what I’ve learned to do over the years because most airline websites only show a fraction of actual availability. Well, American Airlines is making it a little bit easier to visualize where you can go with your miles with their new Award Map feature. You can plug in your home airport and the continent/region you’d like to go, or choose Beach, Ski or Golf. You enter dates, number of passengers and the number of miles you have to use and it’ll populate options, which include airline partners like airberlin, Alaska Airlines, British Airways, Finnair, Hawaiian Airlines and Qantas. However, this isn’t the most robust solution and sadly it can show how little SAAver level availability exists – especially on flights operated by American and not by their partner airlines. Mostly domestic destinations, which makes sense since we are in peak beach season and most tropical destinations require more than 50,000 miles at the peak level. When I expanded the search to 200,000 miles, a bunch more options came up, including the Caribbean and South America, but many of those were in economy at peak levels. No thanks. I then noticed there is a More Options button below the search button that allows you to specify business/first. While there isn’t a “Saver only” button, you can put the minimum amount of miles needed for a saver ticket in that class of service to see what pulls up. Peak awards won’t populate because you don’t have enough miles. I picked a random week in May (8th-15th) and entered NYC to Europe for 100,000 miles and I got some interesting results. Larnaca, Cyrpus and Rotterdam, Netherlands were both available at 100,000, but London (where most Oneworld European flights route) was 112,500 miles. Weird – how would you get to Larnaca or Rotterdam and not be able to get to London (or another Oneworld hub) for the same amount of miles? I clicked through to hold both the Rotterdam and Larnaca awards and it originally brought me to the award search that landed on First class routing at 62,500 miles, which is a little buggy. 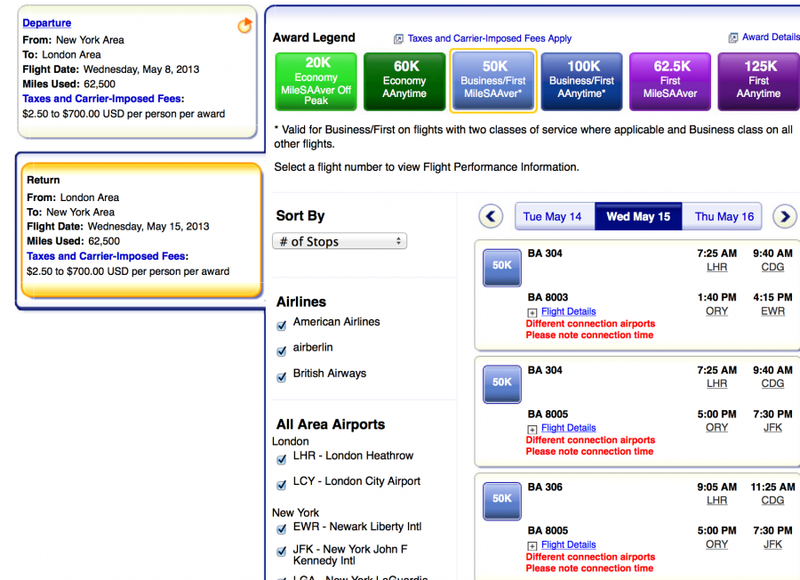 I had to click on the blue 50,000 award and saw that the routing was via London at 50,000 miles each way. So why would those routings to and from London populate as an option? Well it turns out the return had an overnight layover in London, so I thought there wasn’t any availability to get home on the May 15, only May 16, and when I entered that parameter London did show as a result. However, when I went to AA.com and searched my original May 8-May 15 NYC to London in business I was given an option to connect via Paris on Openskies on my original return date, so it should have given that as an option at the 100,000 level on my original dates. 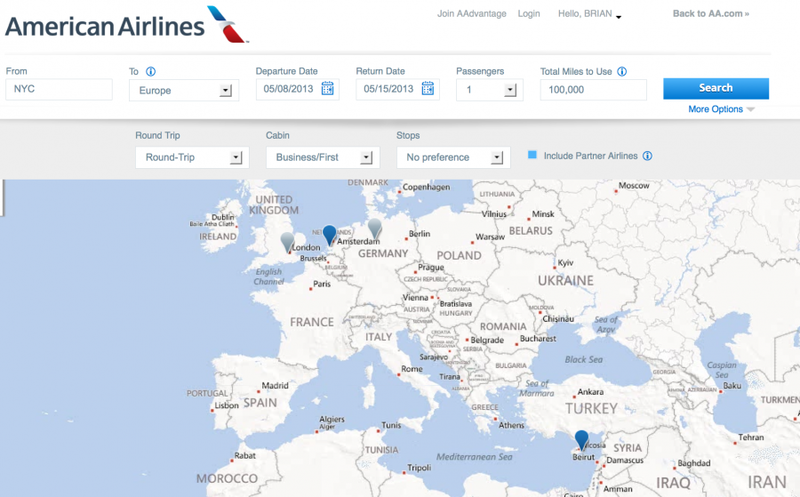 I suspect the issue was that the return was on Openskies via Paris and they were just added to AA.com so the Award Map isn’t reading the availability correctly. Either that or the different departing/returning cities threw off the results (the outbound left from LGA and the return options were to EWR or JFK). Cyrus via London is an option.. but not just London? While there are some bugs, it’s nice to see AA add functionality to help people use their miles, instead of making their websites more aggravating like some airlines (I’m looking at you Delta and US Airways!). This feature is fun, but what I’d really love to see is the rest of American’s partners, including Etihad, Cathay and JAL added to aa.com to make booking AA awards much easier. 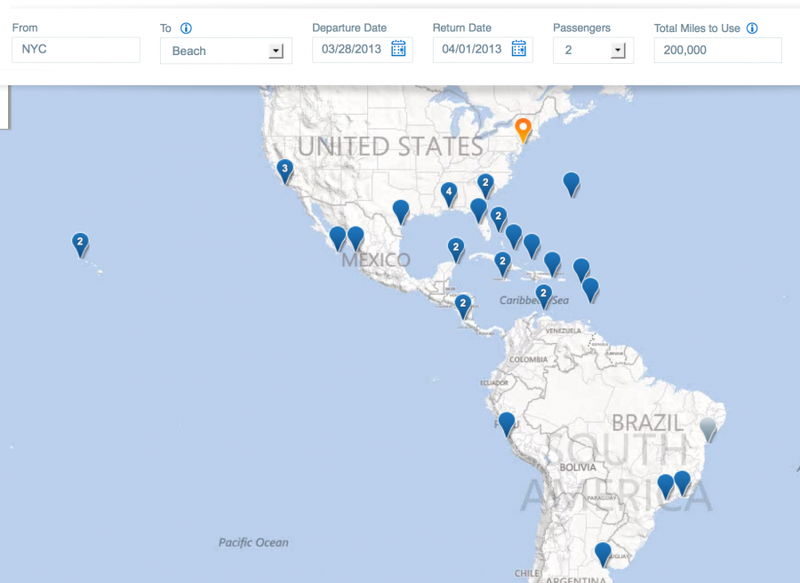 Until then, this is a fun tool to play around with and I hope other airlines improve their online award search engines.